Although All Seasons Naples is conveniently located close to some of the finest Restaurants and Cafés in Naples, our residents and their families and friends experience fine dining daily without leaving the comfort of home. Our Executive Chef and culinary team's highest priority is preparing a variety of fresh, seasonally appropriate entrees and dishes that are all made daily from scratch. 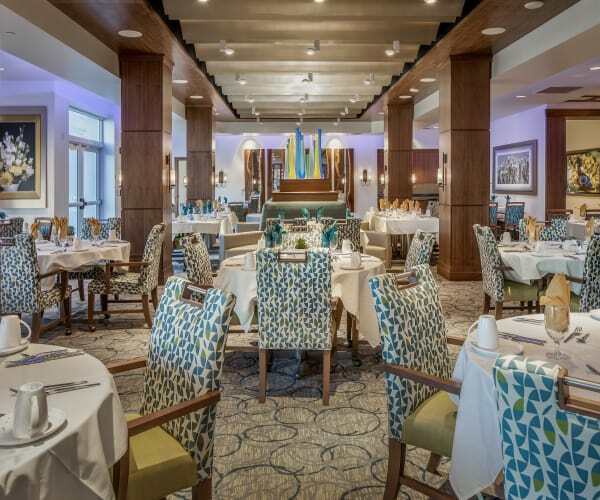 At All Seasons, you will enjoy five-star, restaurant style dining along with daily specials, themed meals, and a variety of house-prepared selections ranging from classic dishes to “new” chef-inspired indulgent creations along with delectable dessert options. Dining with us is truly an experience where you enjoy delicious meals, a warm ambiance, and excellent service with your neighbors, friends and family. 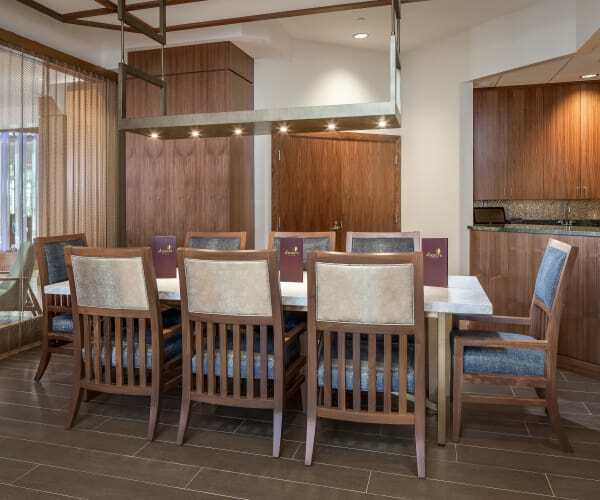 Main Dining Room – is where residents enjoy restaurant-style breakfast and dinners daily. Bistro – is where residents can enjoy a deluxe continental breakfast or soups, salads or sandwiches for lunch. 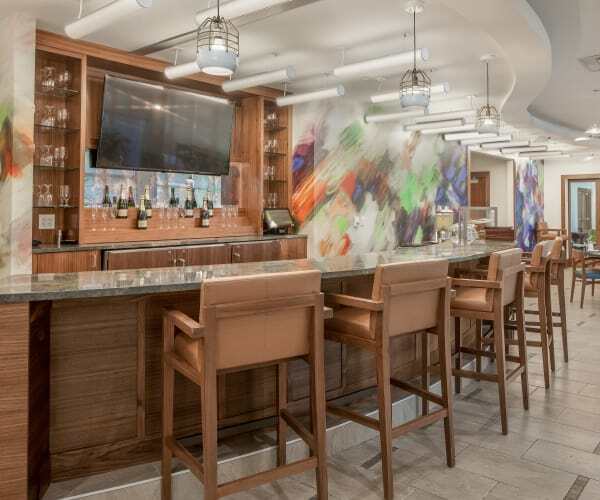 Sky Lounge –In the evening meet your neighbors, family and friends for appetizers, glass of wine, or specialty drink from our full bar. Napa Wine Room and Private Dining Room – available for residents to reserve to host special meetings, luncheons, dinners, and parties. Assisted Living Dining Room and Bistro - is where assisted living residents enjoy restaurant-style breakfast, lunch and dinners daily. 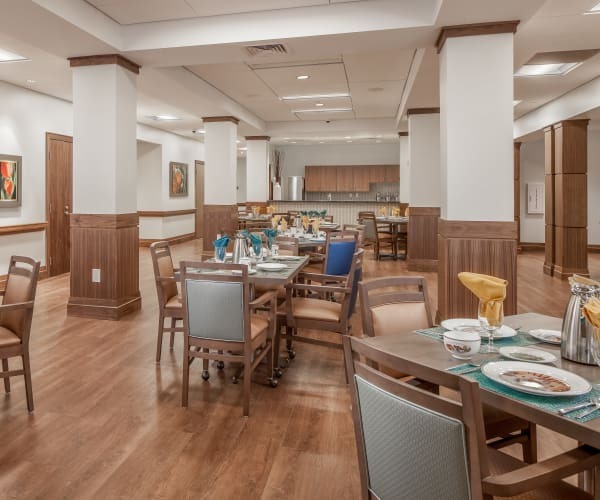 Memory Care Dining Room and Bistro - is where memory care residents enjoy restaurant-style breakfast, lunch and dinners daily. Experience All Seasons Naples, schedule a tour today.